Kids love having the latest toys and gadgets. If you’re stuck on gift ideas for your child, you can’t go wrong with choosing the best hoverboard for kids who love to zoom around on wheels! Hoverboards are very popular with kids as they love the challenge of riding these self-balancing scooters, especially with their friends. Because there are so many to choose from, our team has done a ton of research to find the best and safest hoverboards for your kids to ride on and enjoy. All the hoverboards on our list are UL2272 certified to ensure they’re completely safe. We’ve handpicked the top hover boards for kids across a wide range of prices and we’ve chosen only those that are made to the highest quality standards. We hope you find the pefect hoverboard for your son or daughter, whether you’re looking to surprise them for their birthday, Christmas, graduation or any other special event! The Swagtron T580 Bluetooth Hoverboard is a safe, reasonably priced hoverboard with an awesome look and some great features. Able to handle 44-220 pounds of weight, the T580 is ideal for kids of all ages and adults too! The aluminum rims on the wheels and front and back LED lights make for a cool look. Offering beginner, intermediate, and advanced riding modes, the Swagtron T580 is perfect for both beginners and experienced hoverboard riders. This hoverboard comes with a lithium battery which sits inside an incombustible casing. The battery takes 90-100 minutes to charge and you can go about 8 miles on a single charge. Also included with the hoverboard is an instruction book and charging cable. Stepping on the T580 activates the sensors and from there, you shift your weight to control your direction and your speed. Checking the amount of juice left in the battery is as simple as looking down at the LED lights. 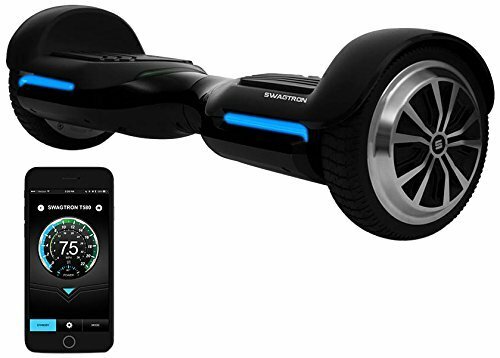 This hoverboard is app enabled using either an iPhone or Android and has Bluetooth speakers. And kids love that they can listen to music as they ride around. The Swagtron T580 is UL2272 certified which means it has passed rigorous testing to ensure that it’s safe. 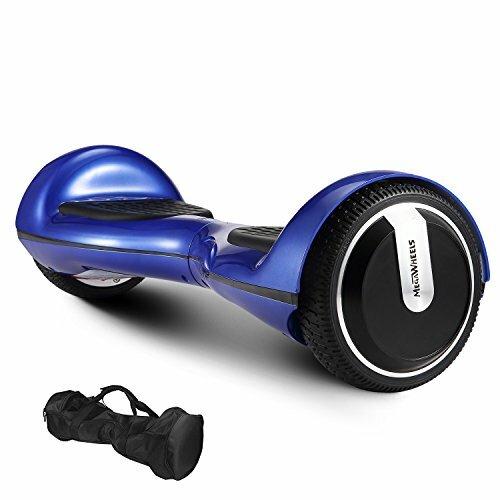 Although parents have purchased this Swagtron hoverboard for kids as young as 6, the recommended age is 8 and up. The T580 comes in your choice of black, blue or red. It’s ideal for short distance commutes and the upper weight limit means that adults can join in the fun too. Kids think this hoverboard is lots of fun to ride! The Tomoloo Q2-C Hoverboard With Bluetooth Speaker is a fun hoverboard that’s safe to ride. 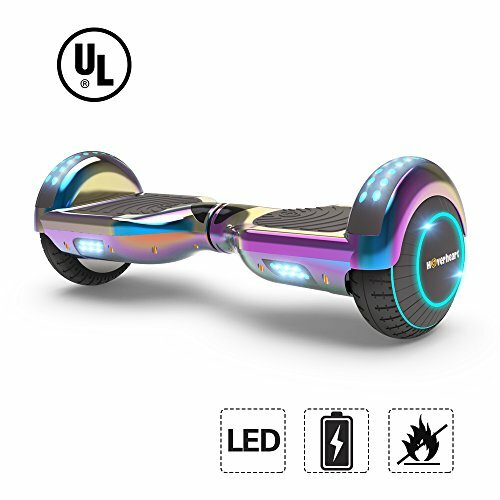 Certified UL2272 safe, this hoverboard is made from UL approved materials. Some of the awesome features include multi-colored LED lights on the front and back, app-enabled (for both Android and iPhone), and Bluetooth capability. The app allows you do all kinds of fun things while you’re riding, including play music and see how fast you’re going. Other features are its 6.5 inch tires, non-slip grips, a battery indicator, a power light, and self balancing technology that makes it easy to ride. Measuring about 26.4” X 10.8” X 10”, it will travel up to 10 miles an hour and can climb a 15 degree incline. This Tomoloo hoverboard will bear weight ranging from 40 to 165 pounds, making it great for kids and adults. The battery takes about 2.5 hours to charge and the hoverboard will go about 9 miles between charges. It comes with a 12 month warranty that provides 24 hour a day, 7 day a week protection for the wheel hub motor, controller, and battery. There’s a 6 month warranty on the charger. Although parents have purchased this hoverboard for kids as young as 7, with a top speed of 10 mph. As with any hoverboard, it’s advisable to equip your child with appropriate protective gear before they ride. The MegaWheels Bluetooth Hoverboard is a basic, fun hoverboard that’s easy to ride and extremely durable, making it an excellent value. It’s UL2272 certified and comes in a variety of colors, including yellow, black, white, and red. This MegaWheels hoverboard two 250 watt motors, takes 90-120 minutes to fully charge and you go get 6-10 miles on a single charge. It travels at speeds of just over 6 mph and can climb inclines of up to 15%. The 6.5 inch rubber tires give you a nice smooth ride and the anti-slip pedals add to the overall safety. The maximum weight capacity is about 240 and it comes with a battery and charger. It’s splash resistant so it can be ridden through puddles and in the rain, and it has LED lights that indicate how much battery is left. Measuring 26″ X 11″ X 11″, parents state that they’ve bought this MegaWheels hoverboard for kids as young as 7, but it’s also great for older kids and adults too. Equipped with 6.5 inch wheels, this hoverboard is UL2272 certified safe and stable. It’s got a built in bluetooth speaker and cool LED lights on the top. Reaching speeds of 6 to 10 mph, the maximum weight capacity is 220 pounds. It has dual 200 watt motors, the battery takes 2-3 hours to charge, and you can ride for about 1 hour on a single charge. Users like that this hoverboard can be used on both concrete and grass and gives a smooth ride on both types of surface. However, it’s worth noting that it has no waterproofing so it should not be ridden in the rain. The self- balancing aspect of this Hoverheart hoverboard makes it easier for beginners to learn how to ride. And because of that, parents have purchased this hoverboard for kids as young as 6 or 7, but it’s also great for older kids. Plus, with a weight limit of up to 220 lbs, even adults can join in the fun! If you’re looking for a basic hoverboard that provides a lot of bang for your buck, this Hoverheart hoverboard is definitely worth checking out! Kids think it’s lots of fun to ride! If you’re looking for a hoverboard that can go faster and farther on a single charge than most other hoverboards, the EpikGo Classic Hoverboard is the one for you! This UL2272 certified hoverboard has dual 400W motors, making it one of the most powerful hoverboards on the market. And those powerful motors give you a top speed of 10 mph and allow you to easily climb inclines of up to 18 degrees. The 8.5 inch rubber tires are protected by aluminum fenders and have high-tread track pads that are designed to allow you to ride over uneven and rugged terrains. 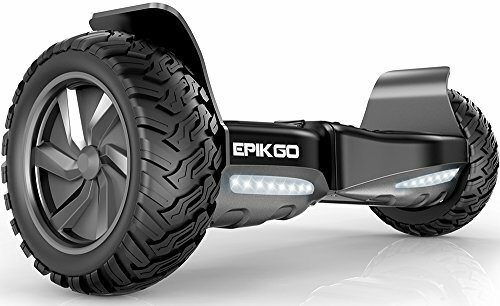 So with the Epikgo Classic, not only can you ride on pavement, you’ll also have no trouble riding through mud or over sand, gravel, and grass. 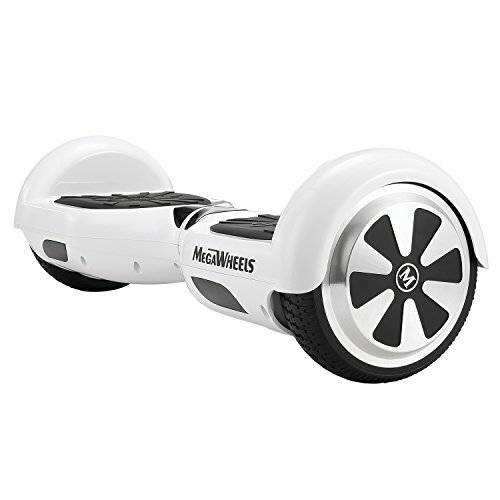 This awesome hoverboard is water resistant, measures 27.5″ X 8″ X 9.1″ and weighs in at about 26 pounds. That’s heavier than a lot of other hoverboards and is a testament to its solid build and durability. The battery takes 1-2 hours to charge and you can go about 10-12 miles on a single charge. The rubber foot pads are anti slip and cushioned, giving you a safe and comfortable ride. The LED turn signals and front facing LED headlights add to the safety of this hoverboard and make it more visible when you’re riding at night. This sturdy hoverboard has a weight range of 44-240 lbs, making it ideal for older kids as well as adults. It comes with a battery charger and has a 1 year limited warranty on parts. Recommended for kids 13 and up, this EPIKGO hoverboard is one of the more expensive hoverboards on the market. But its high quality and awesome features make it worth the price! It’s a blast to ride! This hoverboard is easy to learn and to use. The Segway MiniLITE is a fun, self-balancing personal transporter that’s designed for kids as young as six. This personal transporter is UL2272 certified and can run at top speed of 10 miles an hour. It uses a 155W lithium ion battery that takes about 3 hours to charge and it can can go up to 11 miles on a single charge. Kids love the bluetooth capability and the free mobile app allows them to do cool things such as customizing the colors of the rear tail lights. And the rear tail lights add to the MiniLITE’s safety as they make you more visible if you’re riding at night. The mobile app also allows parents to pre-set the speed limit, giving them control of how fast their child can go when riding the MiniLITE. With large, 10.5 inch tires, you’ll get a smooth ride, even on uneven terrains, whether you’re riding on grass or gravel. This personal transporter is easy to steer: You simply push the knee control bar to the left or right, depending on which was you want to go. Plus the knee bar can be removed for easier transport and storage. It measures 22″ X 10″ X 23″, weighs in at about 28 lbs, and with a maximum weight capacity of 175 pounds, older kids and adults can join in the fun too. 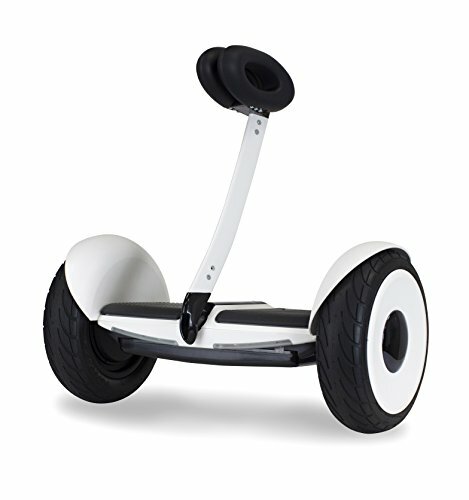 The Segway MiniLITE is ideal for anyone who is looking for a fun mode of transportation! 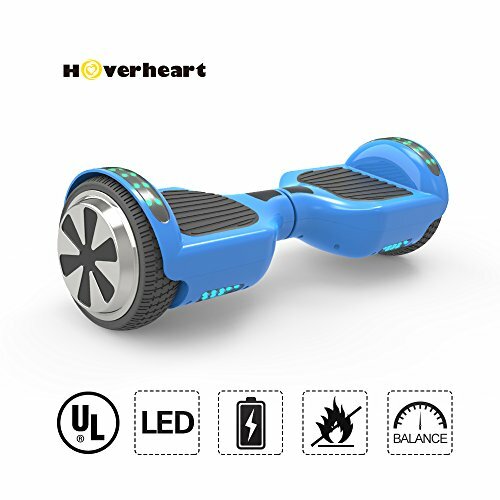 The Hoverheart Lithium Free Hoverboard With LED Flashing Wheels comes in a number of flashy colors, including blue, purple, gold, and rainbow. This hoverboard has 6.5 wheels and kids love that the wheels have LED flashing lights on the outside of each wheel, plus on the top and front. Certified UL2272 for safety, this hoverboard’s lithium free battery is covered by an anti-fire plastic material cover for extra protection. The battery takes about 1.5 hours to charge and you can go up to 10 miles on a full charge. The 400W dual motors give you enough power to go up to 10 mph. And when you get close to the top speed, you’ll hear a beep to let you know that pushing it any further could cause damage. This hoverboard measures 23″ X 7″ X 6.9″ and has a weight range of about 45-220 lbs, making it ideal for pre-teens, teens and adults. As with any hoverboard, we suggest that your child wear appropriate protective gear when riding the Hoverheart hoverboard. With its smooth ride and flashing lights, this Hoverheart hoverboard is sure to a big hit with kids of all ages! From the bright colors to the LED lights, kids find this hoverboard lots of fun to ride! 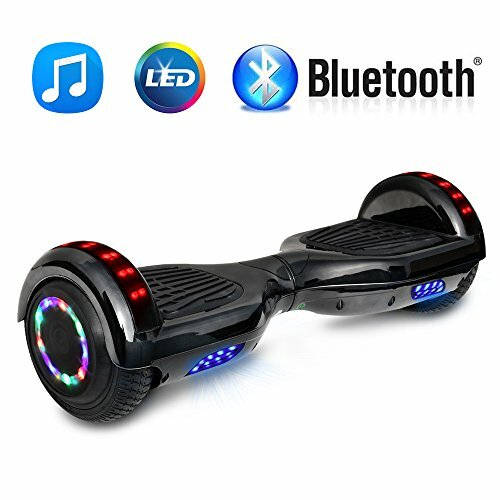 The MegaWheels Hoverboard With Built In Bluetooth Speaker is UL 2272 certified for safety and has a built in bluetooth speaker. 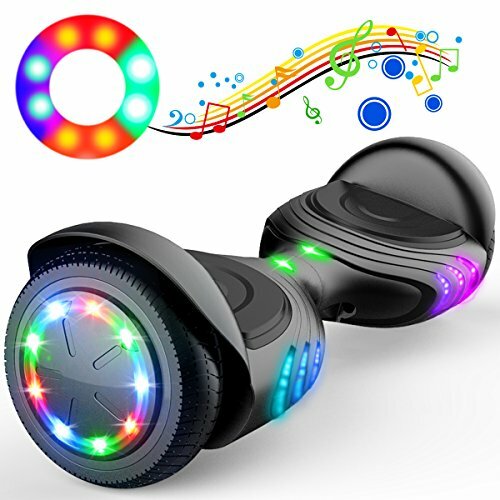 This hoverboard comes equipped with LED lights around the hoverboard and your choice of a wide variety of great colors. The 6.5 inch rubber tires give you a smooth ride on pavement, grass, and gravel. It comes with a lithium ion battery which takes about 3 hours to fully charge and has dual 250 watt motors. You can travel about 8 miles on a single charge and the non-slip surface adds to its safety. The rubber tires are 6.5 inches and will give you a smooth ride over different types of surfaces. It has a top speed of 7.5 mph and can climb inclines of up to 15%. Parents like that it comes with its own carry bag, which makes for easier transport and storage. It also comes with a charging adaptor. This MegaWheels is solidly built and will withstand normal wear and tear for several years. Kids love that the bluetooth connection allows them to enjoy their favorite tunes as they ride along. With a maximum weight capacity of about 220 pounds, it’s ideal for pre-teens, teens and even adults can join the fun! Kids find the lights on this hoverboard to be incredibly fun. Users like that the speakers are great and their music comes out loud and clear. The NHT Chrome Hoverboard is an awesome hoverboard that has a bluetooth speaker and cool sidelights. It’s UL2272 certified for safety and comes in a multitude of colors, including black, blue, gold, and purple. The dual 250 watt motors allow you to ride at speeds of up to 6 mph and you can go up to 7.5 miles on a single charge of the lithium ion battery. The battery takes about 2-3 hours to fully charge. This hoverboard has LED lighting on the front, rear, and on the outside of both wheels. Not only do the lights add to the look of this hoverboard, but they also make it safer for you when you’re riding at night. You can connect this NHT hoverboard to the bluetooth speaker using an iPhone or Android device. And since this hoverboard’s top speed is slower than many other hoverboards, it’s ideal for younger kids; some parents bought it for their 6 year old. But with a maximum weight capacity of about 160 pounds, adults can join in the fun too. Kids love the LED lights! The Epikgo Sport Hoverboard is a great hoverboard that’s safe and fun to ride. The main difference between the Epikgo Sport and Classic is in the tires. While the tires on the Classic version are designed more for off-road riding over all kinds of terrains, the tires on the Sport hoverboard do best on smooth pavement and give you that race car feel. The tires are 8.5 inch and this hoverboard has dual 400W motors that allow you to climb inclines of up to 18 degrees and travel at speeds of up to 12 mph. Its battery takes about 2 hours to charge and you can go up to 10 miles on a fully charged battery. Certified UL2272 for safety, the sport features solid rubber floor mats which make it very comfortable to ride. And it’s water resistant, so you can even ride it in the rain and through puddles. 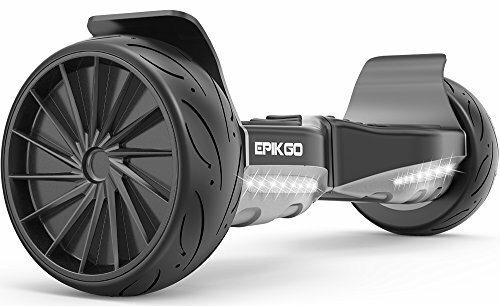 The Epikgo Sport measures 27.5″ X 8.7″ X 9″ and weighs about 31 pounds. The maximum weight capacity of 200 lbs so it can handle adults too. The Sport is made of high quality material and has lights on the front and back for increased safety when you’re riding at night. Since this hoverboard travels faster than most hoverboards, the Sport may be best suited for older kids and teenagers. Although the Epikgo Sport hoverboard is on the expensive side, it’s a great hoverboard that will last for years of normal wear and tear.